Browse Listings 1-8: except “view”-Panel components there is no other code you would need to write. As long a you start with the SQL-annotated abstract Java source everything else gets code generated by the CDB. What if you use CDB with the existing DAO, i.e. IJavaDAO? Splitting of monolythic sync() into three steps is required to support the referential integrity of data: children have to be deleted prior to parents and parents need to be inserted prior to children. And yet we can not addord three remoting calls instead of one (sync()), six calls altogether in our Orders-OrderItems scenario, because server-side transaction can not be spawned across several remoting calls. That’s where BatchService class from clear.swc comes in play. It refers to sequence of several remote method calls-to-do as a “batch”, or, simply array of BatchMember elements: destination name, method name, array of arguments. Instead of multiple remote calls it sends the “batch” as argument of one remote call – to Java class com.farata.remoting.BatchGateway (daoflex-runtime.jar). In turn, BatchGateway’s method execute(List<BatchMember>) invokes the required remote calls sequentially, wrapping the entire sequence in the JTA begin/commit/rollback. bs.registerCollection(orderItems,1); //1 - priority, child of "0"
As you can see, BatchService batch is not confined to DataCollections: you can batch for synchronical server-side execution any sequence of remote calls. While BatchService has been around since 2006. the dataCollection.sync(true) further reduces the amount of code required to transactionally update associated collections. 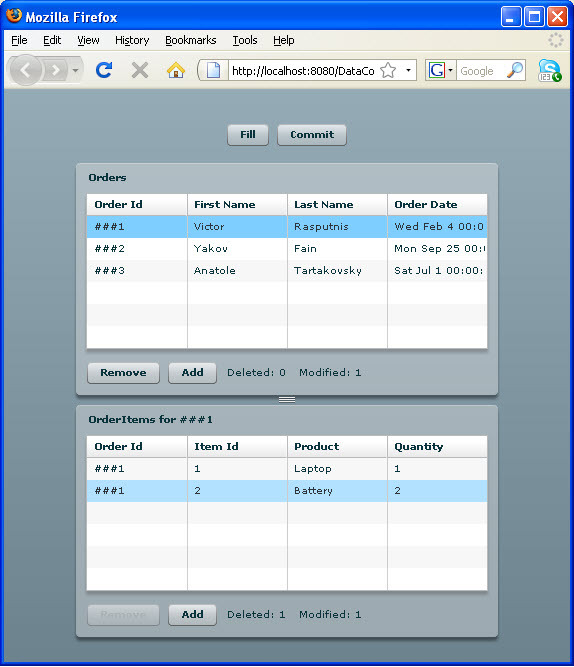 Users of SQL-based branch of the CDB benefit from automatic generation of the required Java functions. Otherwise, your Java DAO has to implement IBatchTransactionServiceSupport.